Edgar started the meeting at 7.35 pm by welcoming all present and noting the presence of two new OLB members Carmel Claridge and David Wong. All present were encouraged to become members of the association and in fact 7 new members paid their entry fee on the night. It was pointed out that people can join via the internet on our website.There were about 70 people present at this stage. Edgar then asked for support for a motion to the OLB urging the Board to enforce a rule that this Hall should only be booked by organisations or societies of good standing and in the case of individuals there should be thorough checks and/or financial bonds to ensure that the Hall is not damaged as it was recently. This was universally supported. From 7.45 p.m. those present visited the various tables manned by the Clubs and societies present. At 8.05 pm Edgar called the meeting to order and club reps spoke for about 2 minutes each about their organisations. 8.17 Stables David. Fundraising opportunities for other clubs. Presentation of ‘tasters’ from next year’s productions this Friday night. 8.23. Ellerslie health and environment. Troy Elliott asked foir support for the Noise Barrier campaign. 8.30 Anthroposophical Society (Rudolf Steiner) Meet at Steiner House every Thursday night and also first Saturday. Bio dynamics on Monday morning. 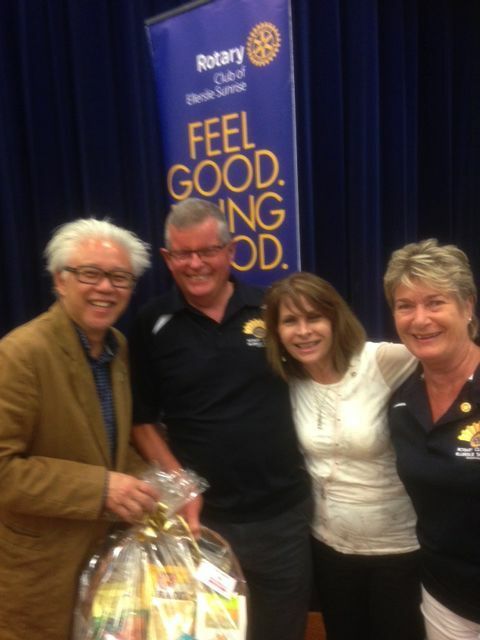 Ron Seeto receiving his lucky hamper with the Rotary Club team from Ellerslie at the ERA Clubs and Societies Marketplace night last Monday 21st November, 2016 at the Ellerslie war memorial hall Main Highway Ellerslie. Draw for gift baskets Attenders. Edgar drew everybody’s attention to the AC phone number 301 0101 for making complaints, getting graffiti removed etc., asked clubs and attendees to consider future use of Liston Park, and email the ERA or the OLB with suggestions.